Anne Hathaway, a farmer's daughter, married Shakespeare in 1582. The thatched cottage that was her home is located in Shottery, 2 miles from the centre of Stratford. To reach it you can leave the town by footpaths that the young suitor may have walked when he went courting there. The cottage remained in the Hathaway family until 1892, and much of the original furniture still remains. The cottage is surrounded by a traditional English country garden and orchard, and includes the magical Willow Cabin where romance first blossomed between Shakespeare and his wife. New Place: where Shakespeare died in 1616. The original property was lost in the 1700s. A memorial garden now identifies the spot where it once stood. 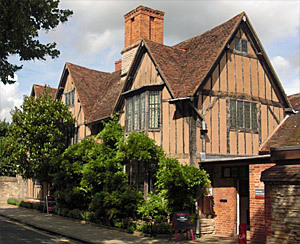 Shakespeare’s Birthplace: located in the centre of Stratford-upon-Avon. An exhibition explains how Shakespeare’s family earned their living and provides the details of his early life. 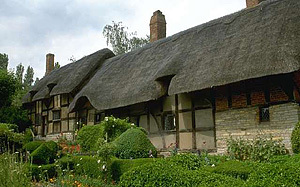 Mary Arden's Farm: A timber-framed farmhouse that once belonged to Robert Arden, the father of Mary Arden, who married Shakespeare's father John. Now a restored working farm museum, providing an interesting insight into the old Elizabethan way of life. Hall’s Croft: The home of William’s daughter Susanna and her husband Dr John Hall. Harvard House: One of the finest Elizabethan properties in Stratford-Upon-Avon, with fine stained glass, painted panels and exterior oak carvings. 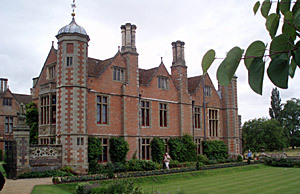 The Hall has an Elizabethan exterior, with an interior in 'Gothic Revival' style. The writer, George Eliot (Mary Ann Evans) was born on 22 November 1819 at South Farm on the Arbury Hall Estate, where her father worked for the Newdigate family. She attended schools at Attleborough, Nuneaton, and Coventry. One of the finest examples of a medieval moated dwelling in England. 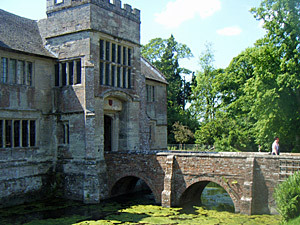 Mainly 15th-c, its broad moat completely surrounds it, so that the only entrance is via a narrow bridge leading to an impressive stone gatehouse. Within there is a lovely garden courtyard with lawns and yew trees. In the Great Hall a massive carved stone fireplace bears a coat of arms of the Ferrers family, who lived here between the 16th to the early 20th century. Not to be missed is an unusual 'priesthole' built under the floor of the kitchen. 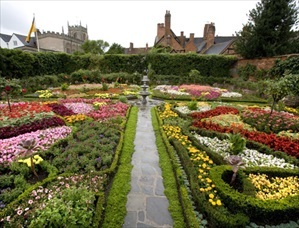 Tel: 01564 783294 - Run by the National Trust. A red brick Elizabethan mansion, much altered over the years. Originated by Sir Thomas Lucy in 1551, it stands on a bluff above River Avon. The interior was reconstructed in Elizabethan style in the 19th-c, with large carved fireplaces, elaborate plasterwork and many fine furnishings and paintings collected by the family. 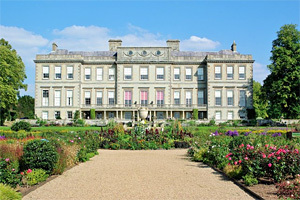 Tel: 01789 470277 - Run by the National Trust. The original cathedral was bombed during the Second World War. Its ruins still stand next to the present Cathedral, designed by Sir Basil Spence, completed in 1962. 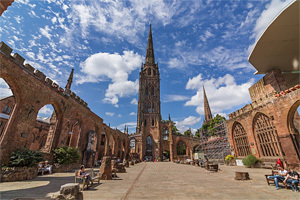 For more information visit our Coventry page. 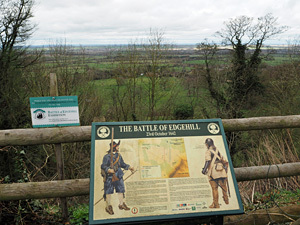 The Battle of Edgehill was the first major conflict of the English Civil War, which took place on October 23, 1642. Legend tells that for several nights after the famous battle, two phantom armies could be seen and heard fighting all over again. Each night, after the King's soldiers had been defeated and fled the scene of battle, the Parliamentary soldiers would remain for a time in triumph and then they too would vanish. Working in a team of between two and six people, you will have just 60 minutes to escape from a locked room before it is too late. With the clock ticking, there is no time to argue. Everyone must work together to find the clues and solve the puzzles so you all make your way out in time. Under 16's must be accompanied by an adult (16+) during this experience. Opening times: see website for online booking system. Built around 1122 by Geoffrey de Clinton, the castle, now mostly ruins, was turned into a palace by John of Gaunt in the 11th century. It later became the home of Robert Dudley, a favourite of Elizabeth I. A fine example of timber-framed Tudor construction (circa 1560), with 17th-c additions. 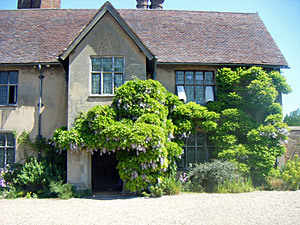 Its rooms contain a collection of period tapestries and good English furniture. Packwood's real delight is its remarkable 50 acre garden, laid out by John Fetherston in the 17th-c. Its collection of shaped yew trees are said to represent the Sermon on the Mount. 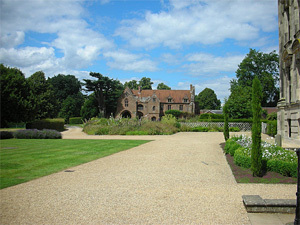 Tel: 01564 782024 - Run by the National Trust. A magnificent Palladian-style country mansion, circa 1680. Decorated by Gibbs and Wyatt. Surrounded by beautiful gardens and parkland. Opening times: open on event days only, see website for details. Built in 1932 to replace the theatre destroyed by 'fire in 1926. William Shakespeare, the most celebrated playwright in the English language, was born on 23 April 1564 in Henley Street in Stratford on Avon. The son of a glover. He divided his time between London and Stratford, settling finally at New Place in Stratford in 1610. He died on 23 April 1616. An Italianate Georgian mansion, built in the early 18th-c, around the remains of a Cistercians abbey. The 14th-century gatehouse is the only part of the monastery that still survives (shown here). A complete restoration of the main house following a fire in 1960 has led to some splendid new décor, especially in the state rooms. Stoneleigh is also a well known venue for many popular farming shows and countryside events. One of the most well preserved medieval castles in England. 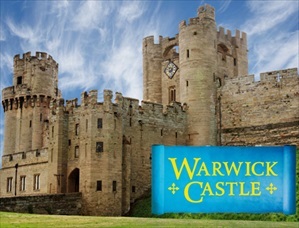 This romantic fortress was once the home of the Earls of Warwick. It stands on an older Saxon site on an escarpment overlooking the River Avon. Its exceptional Norman and later structure hides an interior completely rebuilt during the 17th century. 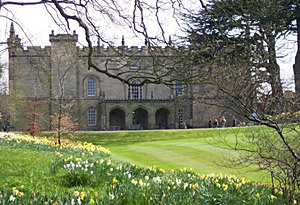 The castle is open to the public all year round and visitors have access to the state rooms, torture chamber, silver vault, ghost tower, and Avon-side grounds that were landscaped by Capability Brown. 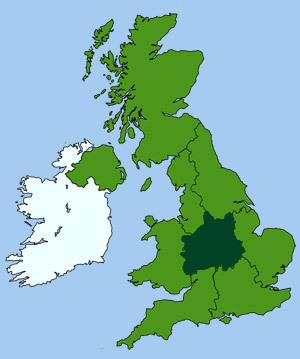 Other places of interest in Warwickshire. One of the finest Tudor houses in Britain, begun in 1480 by Sir Edmund Compton. 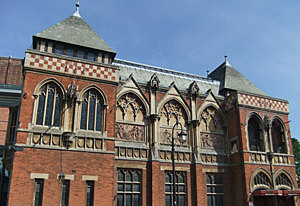 Sir William Compton completed the magnificent red-brick mansion 30 years later, which is now a Grade I listed building. The interior has remained largely unaltered since Tudor times. The estate surrounding the house has been in the same family since the early 13th century. The once wild hillside parkland, close to the house, has been cultivated as a modern topiary garden. The Compton family still live there today and although the property has been opened to visitors in the past, the house and grounds are currently NOT open to the public at this time.